Our Volunteers Light Up the NIGHTS! Volunteer for Northern Spark! from Northern Spark on Vimeo. Northern Spark relies on our volunteers to make the festival a success each year! 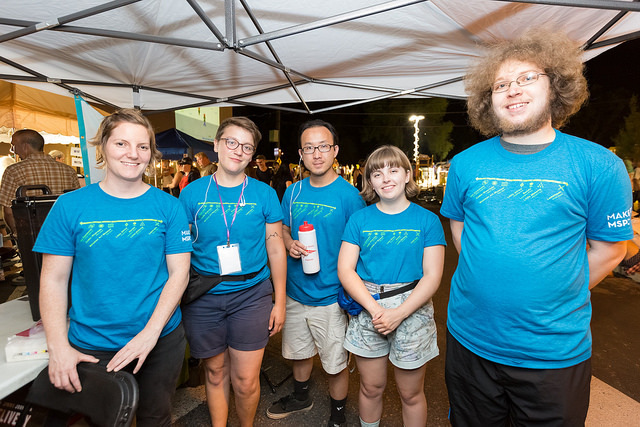 Whether it’s your first time attending Northern Spark or a favorite summer tradition, volunteering with Northern Spark plugs you into a community that lasts year-round. Join us June 15th and 16th for our first ever TWO NIGHT festival! Have a question? Want more details? Curious about other ways to get involved? Feel free to reach out: volunteers@northern.lights.mn. Whether it’s a social club, some friendly inter-office competition, part of corporate philanthropy, or team building – volunteering with Northern Spark is a great way to give back to the community! Groups of four or more play a special role in making the festival happen, and come with nifty perks for your organization! Volunteers at Northern Spark 2017. Photo: Anna Min of Min Enterprises Photography, LLC. We are happy to help create memorable, relevant and engaging experiences for your team! Contact us for more information on Group Volunteering! We’re looking to fill leadership roles for this year’s festival! Volunteer Leads help make the festival the awesome experience it is for our Volunteers and attendees alike! This year, we’re adding an internship role for those who are interested in gaining more in depth experiences with the festival, and building skills with public art festivals! Interested in learning more? Take a peek at our Volunteer Lead & Apprentice postings, and submit an application by April 20th for consideration!